Realising Potential Creative Partnerships, defining our ambitions and strategic priorities. £ for £ match funding from the Culture & Business Fund Scotland. Apply Now! Read more about our membership offering for Arts & Heritage and Business organisations. Find out about our upcoming events and training courses, from sponsorship to copywriting. Hire our meeting room, minutes away from Haymarket Station in Edinburgh. A&BS member and charity discounts available. These are the range of Scotland wide cultural organisations and businesses we work with. 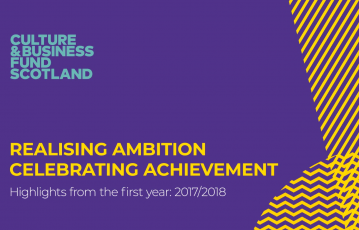 Please see Realising Potential Creative Partnerships, our Corporate Plan for 2018 – 21, that defines our ambitions and strategic priorities for that period. Find out more about the Culture & Business Fund Scotland, the dedicated website and how to APPLY ONLINE. A new interactive digital toolkit to help people working in Scotland’s heritage sector to develop their fundraising skills. The partners behind the four-year Resourcing Scotland's Heritage programme have released the findings of a major new report into the current funding landscape for Scotland’s heritage sector.